Getting to a first draft was tough. Here I had so much material about our previous travels on my blog, and all I had to do was condense the pieces about Cape Town. And that small matter of translating it into German. But it turns out simply translating from English doesn’t work. It sounds clunky, and the humor is all off (I’ve learned that Americans are much more forgiving and easy to please with humor than Germans, which perhaps explains why movies such as The Hangover are always American – but that’s a topic for another day). But writing in German from scratch when you haven’t done that in 20-plus years is even harder. I labored for three days straight. I eked out sentences. I deleted them. Started over. I’d never worked so long or hard on 1,500 words. But finally, FINALLY, I had a presentable article, I thought. Ran it by my German editor (I love saying that, though she’d likely smile at that job description), who had nothing but a few changes, and sent it in. Gulp! Was this good or bad? He had a point there. That is totally what we did. Dangled penguins as the prize if in return we got to go antique shopping. Ferris Wheel for prison visit. Unlimited desserts in exchange for unlimited posing for pictures. I can see where he was coming from. No one gets the burning desire to pack their bags right this minute for their own family trip when reading about your kid spilling the orange juice all over your pants on the airplane or throwing a tantrum in the art gallery.They want to see the perfect family – not too perfect, mind you, because that would be totally unrealistic – but pretty perfect nonetheless. They want to see kids who are eager to explore and to learn something new. They want to see kids who love nothing more than traveling around the world with their parents rather than sitting at home playing Xbox. They want to see the parenting equivalent of that Coca-Cola commercial – loving parents, smiling kids, kumbaya all around! Okay, back to the drawing board. All I had to do was rewrite the whole thing with more kid perspective. That doesn’t sound that hard, right? I decided to ask my kids about their profound thoughts while touring Cape Town. “My favorite place was the gift shop on Table Mountain,” said the second. 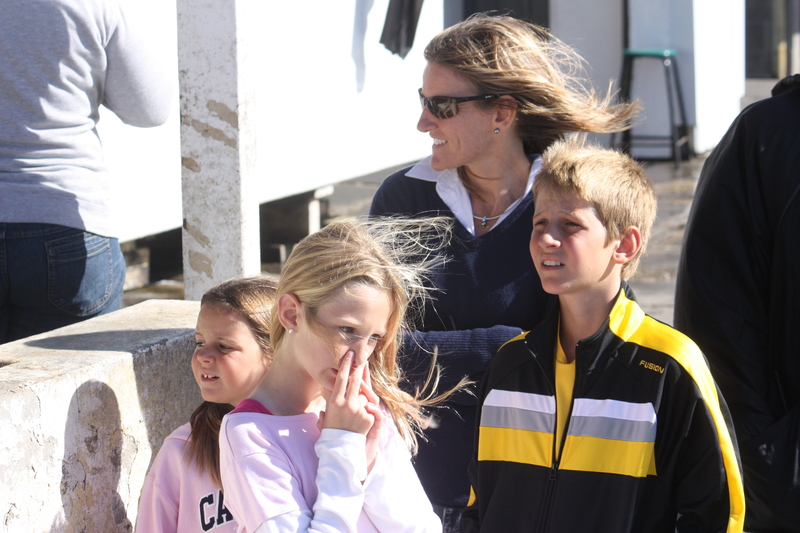 “I can’t believe you made us get out of the car in that harbor [Kalk Bay] where I had to hold my nose the entire time because the fish smell was so bad,” said kid number three. “The chocolate desserts at that cafe [Cafe Paradiso on Kloof Street] were great,” opined kid four. Somehow I thought this wasn’t going to satisfy Mr. Tough Editor. Are there other kids out there who have more profound thoughts, I wondered? I scouted out the competition by reading other “traveling with kids” stories in German newspapers. And the answer is yes, there seems to be a whole gaggle of deep-thinking kids out there, kids who turn all poetic in awe of nature’s majesty, who can spot injustice in the world, and most importantly, who will trudge through a museum for hours and ooh and aah at every single display. I need to figure out how I can rent such kids for my next travel writing assignment. In the end, I kept grilling my kids by asking all sorts of leading questions, until I got satisfactory answers which, with a little imagination, could almost be called profound. I’m pretty sure this is what every other travel writer reporting on family trips is doing too. We’re all out there embellishing details and putting words into our kids’ mouths, and we’re editing out the eye-rolling, the tears, and the foot-stomping. The view is breathtaking. At our feet lies Cape Town, spread out in a large semicircle around Table Bay. The sunlight glints invitingly off the vast Atlantic Ocean to the north of the bay, but up here on Table Mountain the air is freezing and the mood almost a bit eerie. Our youngest daughter, clutching my hand tightly, points to where the cliffs drop off into nothingness right in front of us. “Why is there no fence?” she asks accusingly. This of course is the great paradox in South Africa that often leaves visitors flummoxed. South Africans surround themselves with the most forbidding fences and security systems to keep out criminal intruders but don’t bat an eye at the many other dangers lurking out there, such as the leopards and elephants we’ve come across during a weeklong safari in the African bush. They seem to be content with signs advising to “keep your windows up when driving through lion park” rather than subjecting visitors to a large stack of indemnity forms like we are so used to in our Western lives. Even though Cape Town isn’t really Africa – it’s a modern city where everything works like a charm, as the kids have delightedly taken note of when we were swallowed up by our hotel’s luxury just this morning – but even here the missing fence is a symbol of Africa: vast, utterly pragmatic, and not for sissies. They didn’t pick this picture where my daughter was steadfastly holding her nose for 30 straight minutes. 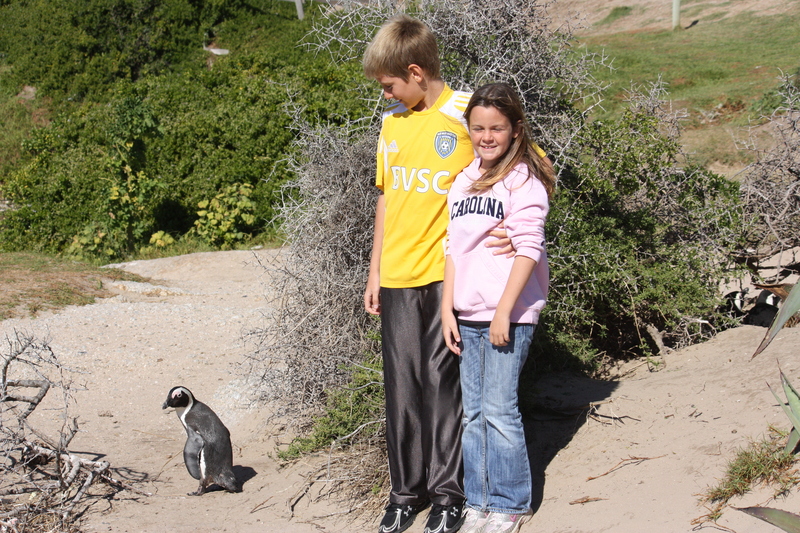 This cute penguin picture was much more acceptable. Next What Does a Book Festival Have in Common with Disney World?